Located in Northern California, Siskiyou County is filled with mountainous volcanoes, clear lakes, and evergreen forests. The trails below are located around Mount Shasta. 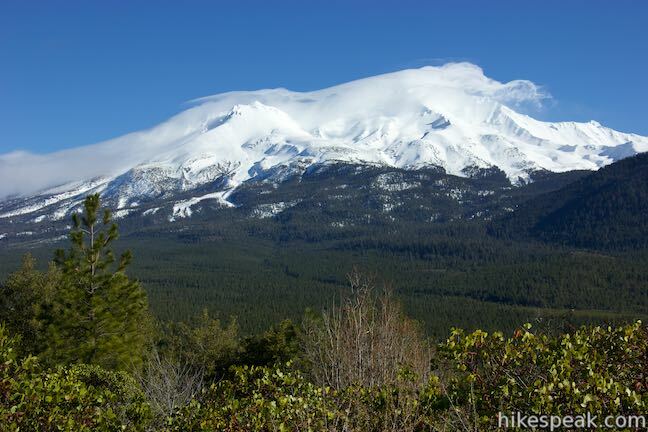 Mount Shasta is a massive 14,179-foot tall volcano that provides a scenic backdrop for many of the area’s trails. This short hike travels along a creek up to an impressive 50-foot waterfall, passing the ruins of an old resort along the way. This 2.55-mile lollipop loop hike tours the top of a volcanic dome with excellent views of Mount Shasta. This short hike leads to a forest-wrapped waterfall, passing behind the falls to arrive at a Sacramento River Overlook. This short and easy lakefront loop offers great views across Lake Siskiyou toward Mount Shasta and the surrounding evergreen wilderness. This 2.9-mile hike hits a short summit near Mount Shasta with excellent views of Mount Shasta, Black Butte, and the surroundings. This 2 to 3-mile hike visits lakes in a beautiful area of Shasta-Trinity National Forest, including the charming-contoured waters of Heart Lake. This approximately 3.2-mile hike ventures off trail above Heart Lake to a summit with extraordinary views of the Castle Crags and Mount Shasta. Up near the Oregon border, the north coast of California has beautiful unrefined features like driftwood-covered coves and mossy forests. Explore this inviting area on Yurok Loop Trail, a short hike through scenic surroundings. This 1.15-mile circuit passes an ocean vista along a dramatic coastline that faces a cluster of rock islands. The loop crosses a small wooded ridge, overlooking a... Read more.